When we think of demolition we usually think about vast explosions or wrecking balls crushing residential or commercial real estate to the ground. 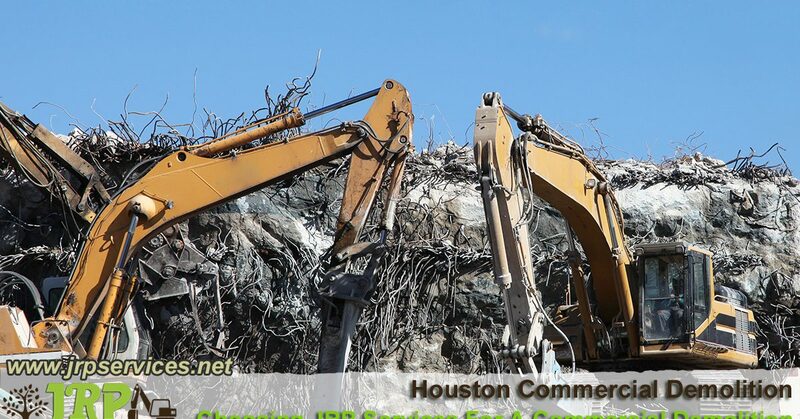 Today we are going to look into the process of building demolition, a service offered by JRP Services of Houston, Texas. We will also be discussing the debris left behind and debris cleanup and removal services. A controlled demolition is an engineered plan of how to strategically demolish a building by minimizing production of dust and debris. The method also allows for less chance of damage to surrounding spaces and architecture. The control is in the ability to plan the pattern and timing of the building to have it fall in a specific way. Controlled demolition is a way to implode a building rather than exploding a building. It is a technique that causes the building to fall inward as opposed to outwards for less mess and compact destruction clean up. This is possible by setting explosives to hit certain key structural points at different times to essentially cause a domino effect down to the base of the building.This type of demolition works well for commercial demolition. A normal demolition of a residential structure, such as a home, can be done quickly by the experts at JRP services of Houston, Texas. With the use of front-end loaders and bulldozers we can plow through your structure. This is helpful for both a full or partial remodel. Don’t worry about cleaning up! JRP Services will remove all of the debris from the demolition for you! They will even help you with landscaping work once the demolition work has been disposed of! Call now to schedule your demolition!